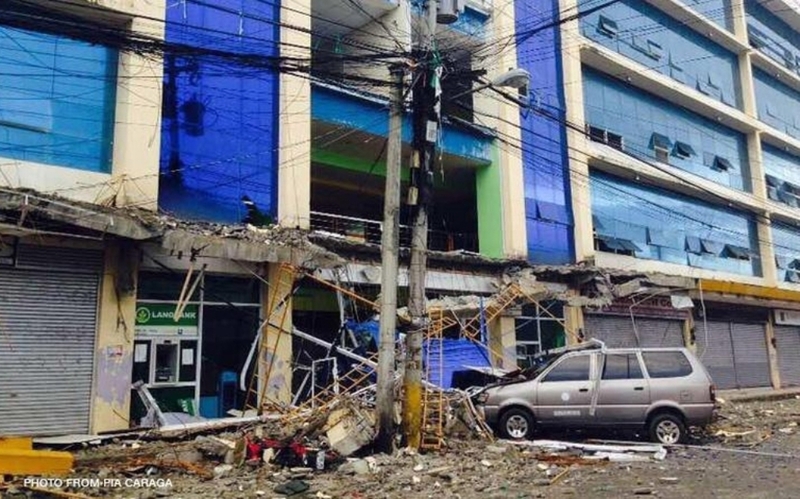 Update 3:30 PM +8 GMT 11th Feb. 2017 : Six people were reported dead, hundreds injured some buildings destroyed, and some roads and bridges are no longer passable after a strong 6.7-magnitude earthquake rocked Surigao City on Friday night. The Philippine Institute of Volcanology and Seismology (Phivolcs) said the quake hit at 10:03 pm, its epicenter 14 kilometers north of Surigao City, Mindanao Island in the Southern Philippines a 1,100 Kilometers distance from Capital Manila. The Office of Civil Defense-Caraga (OCD-Caraga) identified 3 of the casualties from Surigao City as Robert Eludo Jr, JM Ariar, and Lito Wilson. The US Geological Survey (USGS), meanwhile, reported a 6.5-magnitude quake, striking 10 kilometers north-northeast of Mabua and some 12 kilometers north-northwest of Surigao, and occurring at a depth of 27 kilometers. The Pacific Tsunami Warning Center said there was no tsunami threat from the quake. At least 61 people were injured and 14 were admitted to the Caraga Regional Hospital in Surigao City, OCD-Caraga said on Saturday morning. Regional civil defense spokeswoman April Sanchez said 7 people were injured in Sison town and 5 were brought to Bad-as Hospital in Placer, Surigao del Norte. Surigao City public information officer Annette Villaces said some roads and bridges are no longer passable. 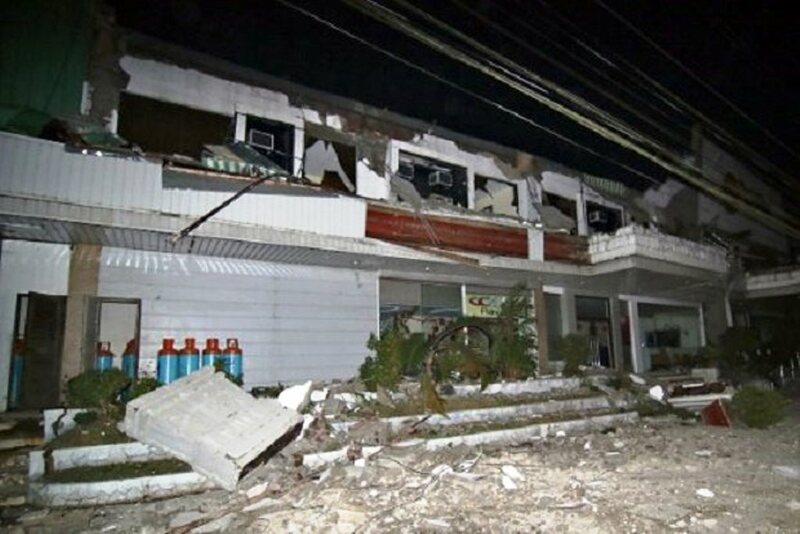 The quake also damaged some buildings and caused houses to collapse. Classes in all levels have been called off, along with work in government and private offices in Surigao City. Phivolcs also reported a number of what appear to be aftershocks following the quake, ranging from 2.0 to 3.9 in magnitude. "There are a lot of cracks on the ground. 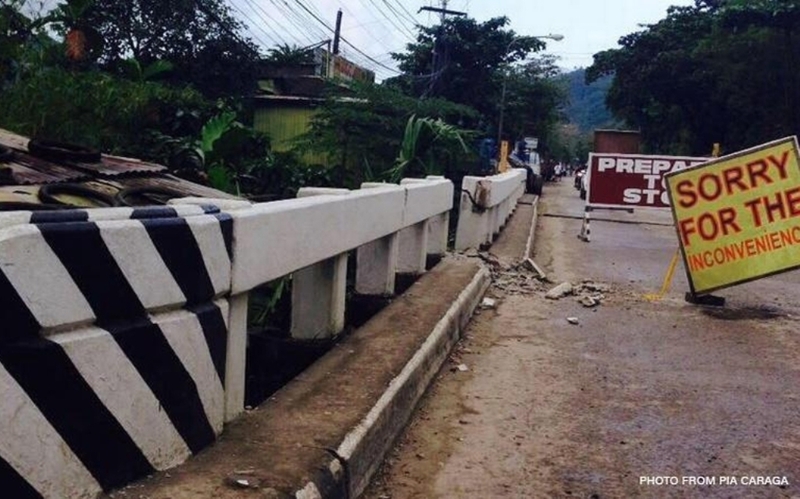 Some of the bridges have also suffered cracks," said Daphne Agonia, the seismology chief based in Surigao. 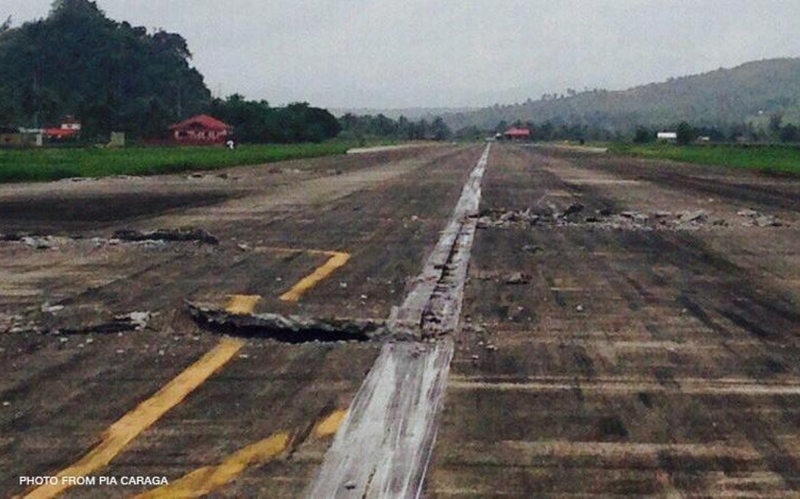 The Civil Aviation Authority of the Philippines (CAAP) ordered the closure of the Surigao airport Saturday morning, dzMM reported. In its Notice to Airmen (NOTAM), the CAAP also ordered the closure of Runway 18/36 until March 10, dzBB said. Meanwhile, Port Police Froilan Caturla said that due to damaged and non-passable bridges leading to Lipata Port, all vessels and port operations will be diverted to the Port of Surigao. 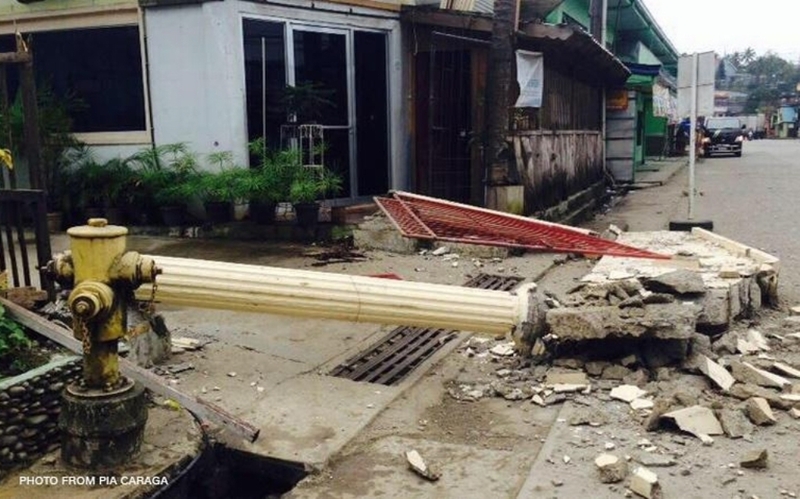 The area's police chief Senior Superintendent Anthony Maghari told dzMM that he saw a schoolhouse had collapsed and that many other buildings had developed cracks. Maghari added the city was suffering from a power outage and that police were checking for any more casualties. University professor Rocks Tumadag said many people in Surigao rushed to higher ground after the quake, fearing a tsunami. He said aftershocks were still rocking the city hours after the quake. "There was panic in the streets," he told AFP, adding that many structures had sustained damage and rubble littered the streets. "I was sleeping when the quake happened. There were 10 to 15 seconds of vertical motion." "When it stopped, I grabbed my youngest daughter and ran outside. My wife also ran outside, my eldest daughter was crying," he said. "We have a lot of quakes here but this was the strongest ever." A civil defense statement said one bridge had collapsed, along with at least one building and several houses. "There were reported trapped individuals inside. 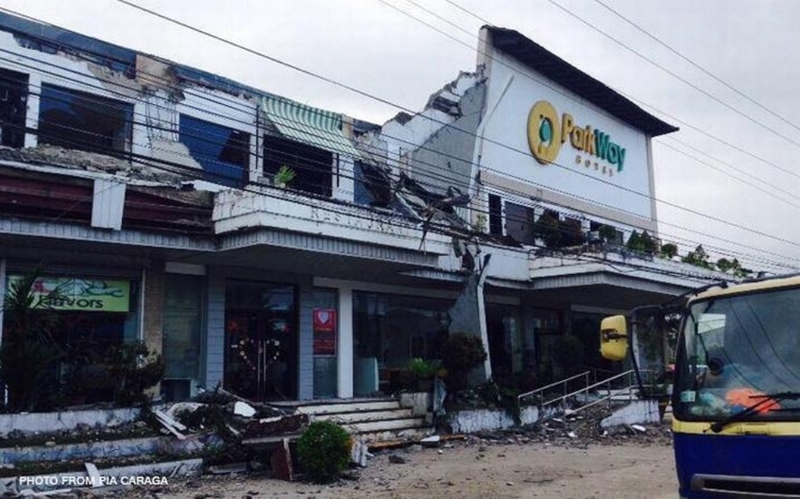 Rescue efforts are ongoing," the statement said.